Singapore-city is on the south side of Singapore island around the Singapore River. It was here that Englishman "Raffles" merged in 1813 and began his dream to grow this small fishing village as the pearl of the region. This famous city state is usually done as a stopover to tourist attractions such as Bali or Australia but is definitely worth staying longer. This city state is a mix of Chinese, Malaysian, Indian and Western cultures in all it’s facets. Here you will find high modern glass office buildings, theme parks, department stores with the most expensive items and casinos. A street further away are campongs where rooms are located around Chinese food stalls and live in terraced houses. 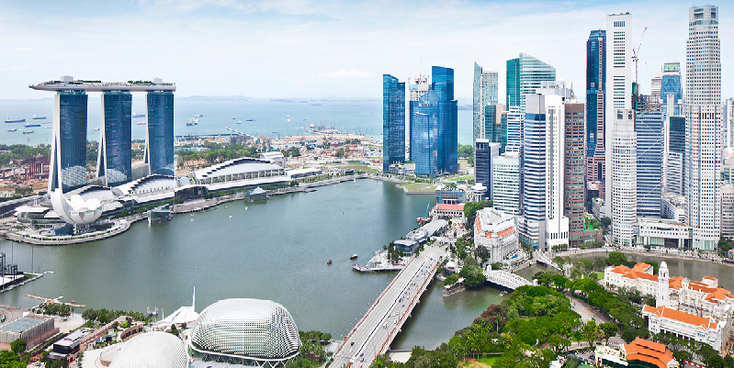 Singapore has colonial buildings, WW2 fortifications, interesting museums as well as national parks, temples, mosques and churches and all on a relatively small area close to each-other. The colonial district thanks its name and location to the British who landed here; they were the ones who built a port around the hill where they built fort "Canning" as a base that would grow as what became the Singapore bastion. Today you can visit the "Battle Box" museum where in WW2 the English headquarters was based. In this district you will find most of the colonial remains even if they also show the super modern high-rise buildings next to them. 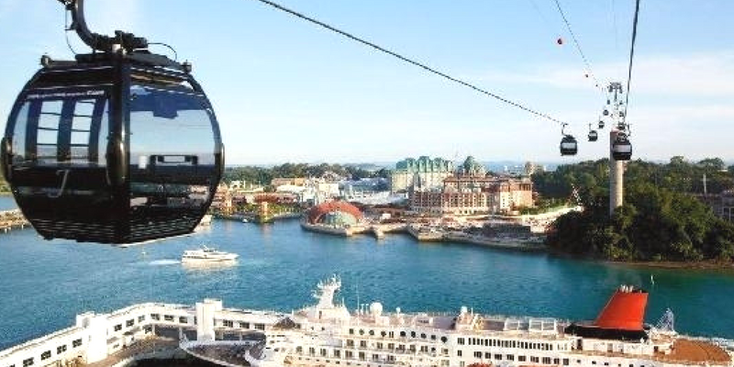 In addition to many museums (including the National and Museum of Asian Civilization) you will find the "Esplanade" (Theater at the Bay) and Singapore's Ferris wheel. 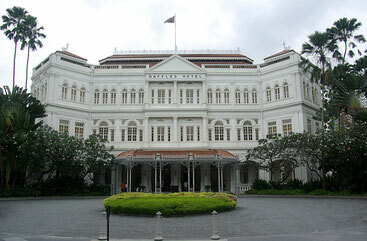 One of the symbols of the city is the "Raffles" Hotel - opened in 1887, this hotel got a mythical oriental status until it was almost lost in the 70's. It renovation was budgetted on a million dollars in the 80's and is now another hotel for the richest in the world. Finally, you can visit the "Saint Andrew's" Cathedral and / or the "Kuan Im Thong Hood Cho" temple. The banks (quays) in and around the Singapore River were once the commercial quays where goods were temporarily stored to and from the whole world. After a thorough renovation, these are now again a commercial up-market with restaurants, bars and flashy modern shops. The culture heart of Singapore is Chinatown; It was here that immigrants reported themselves massively and lived in sometimes awkward circumstances in small houses located in staggering narrow streets, alleys and streets. But this area has also been addressed now that some now speak that the district has lost its soul. I’ts main temple is where the alleged "Buddhist tooth" would be preserved. In addition to other temples, you can see the pre-war "Baba" terrace house, the city gallery or the Chinatown Heritage Center. East of Chinatown, "Little India" that once begun as the European Quarter of Singapore. It is now the Indian city center with many Hindu religious halls such as the "Sri Veeramakaliamman" and the "Sri Srinivase Perumal" temple. Almost next to the Indian district, one finds the Muslim district, namely Kampong Glam. 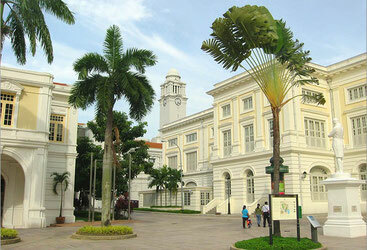 Highlights of this district are the Malaysian Heritage Center and the "Sultan" Mosque. Singapore's main shopping street is "Orchard Road" where you can shop while its possible watching the city’s greenery in the Botanical Gardens. Mount Faber is another high point at 105 meters. This hill is a tourist attraction because of the panoramic view of the harbor and the city. Furthermore, the zoo of Singapore (with its famous night safari) is recommended and with children the Sentosa amusement park which is located on the South Island. This park can be reached by a cable car with a beautiful view of the city center (with skyline). Changi International Airport is the name of the Singapore International Airport and is located at Changi's east side of Singapore's island, about 20 km from the city centre. The "Singapore" Railway station is located in the southwest of Chinatown. Ferries for inter alia Indonesia sail from Changi Point on the east side of Singapore Island (just north of the airport). Singapore actually has three bus stations that are not so far apart. Lavender street bus terminal is located on the same street in northeastern Kampong Glam. Golden Mile Bus Terminal is approximately one kilometer south of (at the Golden Mile complex). Finally, there is the Queen Street bus terminal located on the Arab street near Little India. Singapore has a metronet that covers part of the island of Singapore. The budget hostels were usually small in Singapore, dark and filthy. In recent years there has been a new approach - around Kampong Glam and "little India" - a number of new hostels with spacious dormitories, bright and modern with all facilitie sprung up. The TV series "Bring 'm back Alive" is about the white hunter "Frank Buck" who works from the bar in hotel "Raffles" during the 30's against all the evil that's going on in those years. The series was on TV in 1982 and 1983. From 2008, Singapore will be launching Singapore's Great Price each year (Formula 1).